LG has released G7 Plus ThinQ smartphone with top-notch design. The top-notch pattern is so popular that most of the brands that didn't release it once launching it one by one right now. LG G7+ ThinQ smartphone comes with high-end features at INR 40k budget to compete others in the market. Let us see how it differs and chase the race. 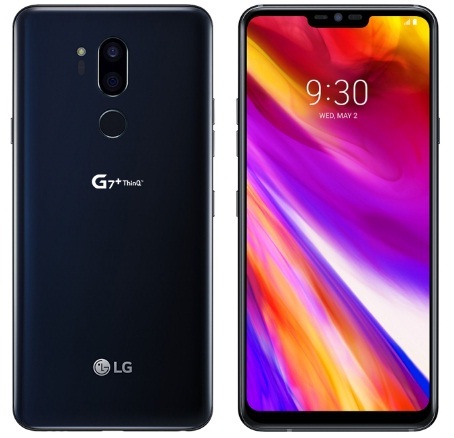 If you are eagerly looking for LG G7+ ThinQ phone key features, technical specifications, price, review and other detail excluding comparison and hands-on review etc. then you would find some of them over here. The beautifully looking Top-Notch design smartphone is powered by Qualcomm's Snapdragon 845 processor and coupled with 6GB of RAM. The brand boast about AI camera and its 19 shooting models and three preset effects beside the rear camera Bokeh effects. The phone runs with the latest Android Oreo 8.0 operating system though Google recently launched the updates of Android Pie OS. Hopefully this device also be able to upgrade Android Pie OS later. The internal storage of the phone is of 128GB which is further expandable up to 2TB through microSD. Regarding camera of the LG G7+ ThinQ is of 16+8 megapixel front shooter or selfie and 16 megapixel is of rear one. LG G7+ ThinQ is one of the most features packed smartphones at the moment. Hopefully the best smartphones or best selling smartphone here. You may get the best deal as well. Here you go for this device specs and price detail. Tips: This is one of the high-end specs top-notch features phone to grab. The price seems higher compare to OnePlus6 and Asus ZenFone 5z phones though LG brought it with some new features.